The Dubliner, 45, was four under playing the 18th but three putted to finishe the day tied for 33rd after a marathon eight-hour day on the course. Battling a bad left knee and fatigue from contending in Germany last week followed by Monday’s Open Championship qualifier at Sunningdale, he knows he has to rest as much as possible to conserve energy for a potential title challenge at the weekend. One of the players caught by a 98-minute weather delay early in the afternoon, McGinley said: “It is never easy when you have to stop and start all over again. I’m annoyed with the bogey on the last. I fell asleep to be honest. No excuse. Bad concentration. 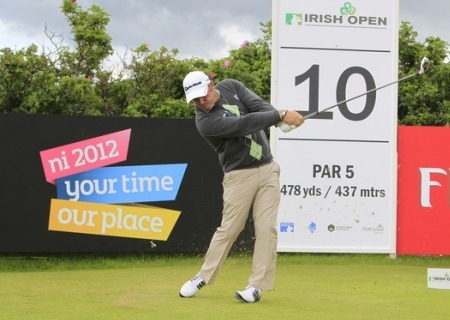 The Dubliner is riding a wave of good form after two years in the wilderness but all he wanted was an early night after a long day on the links where he was twice beaten in the North of Ireland Championship final. Chasing a top-two finish that could seal his place in The Open through a mini order of merit ranking, he said: “All I am concerned about right now it getting rest to be honest. It’s been a long week already with Open qualifying on Monday on the back of a big week last week and eight hours on the golf course today is not much fun either. “I am a bit fatigued and the most important thing is that I get a bit of food and get to bed as early as possible. A serious contender for the 2014 Ryder Cup captaincy - Scotland’s Paul Lawrie and Spaniard Miguel Angel Jiménez are his biggest rival - McGinley birdied the tough fourth and then made a hat-trick of birdies from the seventh to turn in 32. But while he bogeyed the 14th and birdied the par-five 17th to get within three of the lead, he was upset to throw away a shot at the last.